It was over 40 years ago that the Treasury wound up its official “Historical Section”, as part of the public spending plans that followed the IMF assistance programme of 1976. These days HM Treasury still does not have the luxury of an official “in-house” professional historian. But it does have a thriving History Network, entirely run by volunteers from across Treasury and the other departments occupying the government offices in Great George Street. 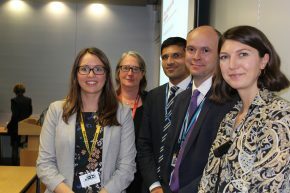 Our Network of enthusiastic volunteers is supported by the Treasury’s senior management team, including members of the Treasury’s Executive Management Board, who regularly take part in events. And the Network also works alongside our external partners to deliver on its core objective: to allow colleagues to learn about the history of our department, our building and our policies. One of the many activities that the Treasury History Network undertakes is to put on events so that colleagues can reflect on past policy challenges and learn the lessons from history. In early October, HM Treasury held a conference to reflect on 10 years since the financial crisis of 2008. The Strand Group and the King’s Business School were the academic partners for the event. 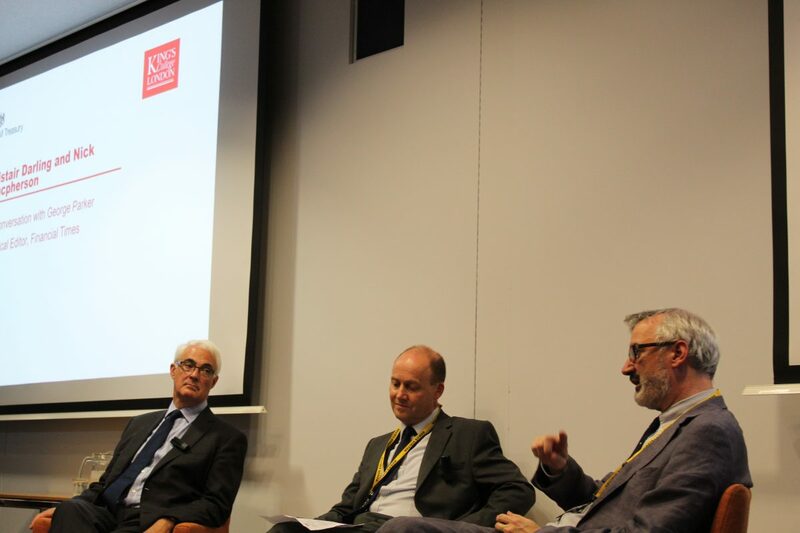 The guest keynote speakers were Nicholas Macpherson (King’s Visiting Professor and HM Treasury Permanent Secretary 2005-2016) and Alistair Darling (Chancellor of the Exchequer 2007-10). The conference kicked off with a lecture by Professor Barry Eichengreen, a leading economic historian from UC Berkeley. Professor Eichengreen has written extensively on the parallels between the 2008 crisis and the Great Depression. He argued that policymakers in 2008 did learn the lessons to avoid another depression: monetary and fiscal policy were loosened, and financial sector interventions limited bank failures. But in avoiding another Depression, policymakers also missed an opportunity to introduce more substantive measures – their “success became the mother of failure”, according to Professor Eichengreen. The Treasury panellists gave a fascinating insight into the various phases of the crisis, and the difficulty of working in such an uncertain environment. In particular, they recounted how challenges came to a head following the collapse of Lehman Brothers in September – and how the weeks either side of Friday 10 October 2008 were two of the most momentous, and scary, in the Treasury’s recent history. 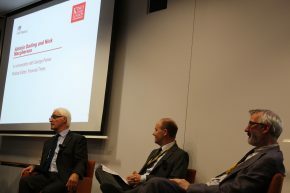 In the second afternoon session Lord Macpherson was joined on stage by Lord Darling in a session chaired by the Political Editor of the Financial Times George Parker. Lord Darling and Lord Macpherson painted a vivid picture the Treasury during those tumultuous days, that night – a frenzy of activity with officials, advisers, bankers, lawyers all over the building, negotiating the details of the bank bail-out package. The announcement was finalised in the middle of the night and announced at 7am: £50bn of capital for UK banks, a doubling of Bank of England liquidity support to £200bn, and £250bn of government guarantees for inter-bank lending. A staggering £500bn to stabilise the system. The event was a complete sell-out, with a huge audience of Treasury officials, and loads of positive feedback about how insightful and useful the event had been. The volunteers from the History Network showed that it is possible to make the past not only interesting, but relevant. 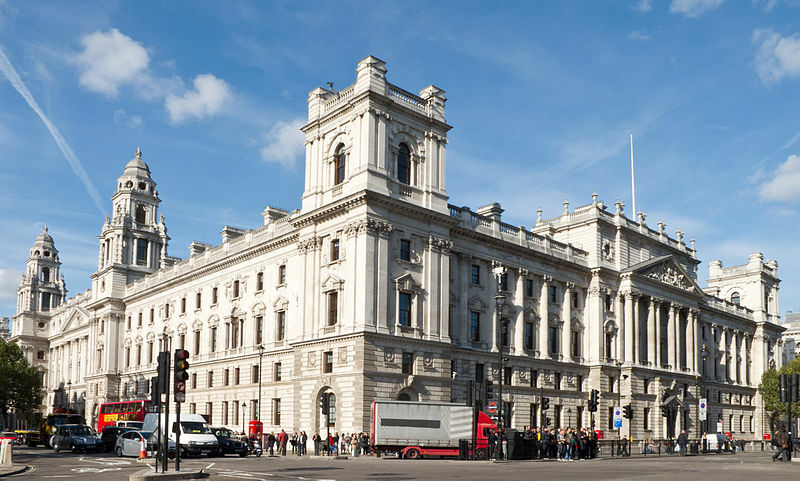 The Strand Group partners with HM Treasury with a series of events, a unique MA level module and provides institutional history training.